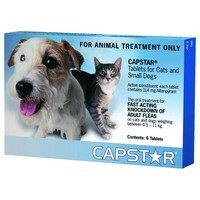 Capstar Flea Tablets for Small Dogs and Cats are an effective flea treatment for cats and dogs weighing 0.5 to 11kg. Safe for pets, but deadly for fleas, Capstar starts working to kill fleas within 15 minutes and will last for a further 24 hours to kill all adult fleas present on your pet. Used with an approved household flea spray to kill all flea eggs and larvae in your home, Capstar can provide up to 12 months continuous flea control when used regularly. Each fast-acting tablet contains 11.4mg Nitenpyram. it's mainly for if they have an outbreak of them, but only down fall is its not a long lasting protection against them, you have to use other forms of protection against them too at the same time, I use it on my dogs and cats. Not only did this arrive in good time it actually works !!! I have tried every flea treatment going and I have 7 cats and I popped one in each mouth and within 15-20 mins I had my cats going crazy and the fleas were dying. I took a brush to one with a can of spray in hand just in case and the flea I pulled off was dying so I am very very happy with the product and will buy more to keep them updated till all the fleas in my house are gone. I couldn't believe just how quickly this product works. One of my cats has flea allergy dermatitis and she gets very scabby. Within 48 hours her skin was normal and one week later it is still scab free. The only downside is that it doesn't last very long. I would strongly recommend it for cats with FAD though, as my cat got very depressed about her scabby coat and now she is much happier. A really good flea killing product. My cat was absolutely riddled with fleas, so bad that I had to break the 'scab' of flea droppings before I could effectively groom him. I gave him one tablet, and about 5 hours later he was flea free! Unfortunately about 18 hours later he had fleas again! This is an excellent product for actually killing the fleas but you need to use in conjunction with another product like Frontline Spot On, and also a household spray to ensure that the flea larvae do not hatch. We still have an ongoing problem with fleas, but I have now ordered some Frontline Flea Spray that you directly spray onto the cat. I have had to purchase from France though, as I think it may be prohibited in the UK for some reason as you need a prescription to purchase, and our local vet would not provide a prescription. Also I have found out that you can also buy Frontline Spot On Plus, which gives your cat protection for up to 3 months rather than 1 month. Again, for some reason this is not for sale in the UK, so I may buy this from Europe again, which is quite frustrating, but I will do almost anything to get rid of the fleas, as they are all over the house, and regularly jump off me, my husband and also my 2 year old little boy and 5 year old daughter, and I am frightened to invite any of my children's friends round to play in case any of the fleas jump onto them! Extremely good for a boarding cattery. One pill, treat all bedding and they are flea free until they leave!